Souleymane Badolo traces the journey of his great-great grandfather, the lessons his father taught him, and the responsibility to pass on these values to his own son in Buudou, BADOO, BADOLO. In a meditative, new work in progress developed at MTA, he emphasizes nature and bodies clothed in natural materials such as grass, leaves, and clay. 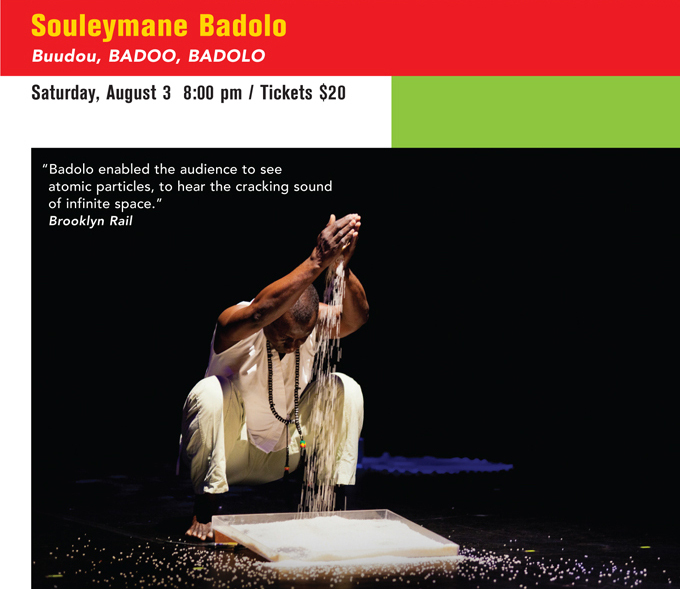 Choreographer and dancer Souleymane ‘Solo’ Badolo was born in Ouagadougou, Burkina Faso. His Burkina Faso-based troupe, Kongo Ba Téria, fuses traditional African dances with western contemporary dance and tours internationally. He received the Juried Bessie Award in 2012 and teaches contemporary dance at Bennington College. Souleymane Badolo’s residency is made possible through a partnership with Danspace Project.